The time is NOW to hold big banks accountable for their role in the economic crisis. 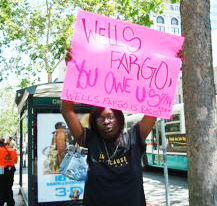 Come out to the biggest bank protest of the year at Wells Fargo’s Shareholders meeting in San Francisco! Hold Wells Fargo Accountable – Tuesday April 27th from 12p-2pm. Wells Fargo is a profit making machine and among one of the biggest culprits in this current economic crisis. After they received more that $36.9 BILLION in taxpayers bailout money, Wells Fargo CEO John Stumpf received more than $21.3 MILLION IN BONUSES IN 2009! The foreclosure crisis has caused a loss of more than $93 Billion in Black wealth since 2007 and Wells is well known for their discriminatory practices, specifically targeting Black communities, Black churches and paying high incentives for loan officers to sell bad loan products to poor and working class communities. 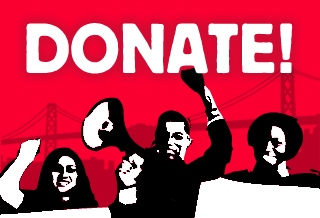 Wells is responsible for 15% of the foreclosures in Oakland and 13% of SF foreclosures – they cheat borrowers, harass tenants and have blighted our communities – It’s time for us to come together to demand real accountability from the grassroots up! Please stand with us in this march and rally! < Victory! Neighbors Stop Foreclosure!